The entire state of North Carolina, including all counties in the Triangle, have come under emerald ash borer quarantine rules restricting the movement of hardwood firewood, ash nursery stock and other ash materials. North Carolina becomes the 15th state in the country with a statewide quarantine. The beetle was first detected in the United States in Michigan in 2002. It is responsible for the death or decline of tens of millions of ash trees across the country. The pest can affect any of the four types of ash trees grown in North Carolina. The quarantine allows for the in-state movement of hardwood firewood and plants and plant parts of the ash tree, including living, dead, cut or fallen, green lumber, stumps, roots, branches and composted and uncomposted chips. However, movement of these items outside the state into non-quarantined areas would be prohibited. Firewood that has been treated, certified and labeled in accordance with federal regulations can be moved outside the quarantine area. The Plant Industry Division and the N.C. Forest Service are working in cooperation with the U.S. Department of Agriculture’s Animal and Plant Health Inspection Service. Contact the USDA State Plant Health Director for more information on federal quarantine regulations and firewood certification at 919-855-7600. Symptoms of emerald ash borer in ash trees include a general decline in the appearance of the tree, such as thinning from the top down and loss of leaves. Clumps of shoots, also known as epicormic sprouts, emerging from the trunk of the tree and increased woodpecker activity are other symptoms. The emerald ash borer is not the only pest that can cause these. 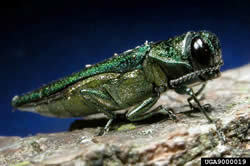 Emerald ash borers overwinter as larvae. The adult beetle is one-fourth to a half-inch long and is slender and metallic green. When the adults emerge from a tree, they leave behind a D-shaped exit hole. The larvae can also create serpentine tunneling marks, known as feeding galleries, which are found under the bark of the infested trees. Options for the urban or landscape/ornamental ash tree include removing the ash tree, replacing the ash tree, or keeping the tree by treating it with pesticides. The guide lists 17 pesticides for EAB treatment that have been registered through the N.C. Department of Agriculture and Consumer Services Pesticide Section and also have been tested in field trials through universities or government agencies. Homeowners may also want to contact a certified arborist if they are uncertain about applying pesticides themselves or if their tree is large. “Generally, it is worth hiring an arborist if you want to protect ash trees larger than 20” in diameter, but arborists can serve any size tree,” Trickel said. To calculate your tree’s diameter, measure the width in inches around the tree at 4.5 feet above the ground. Divide that number by 3.14, and that will give you your diameter at breast height, or DBH. DBH is directly associated with the amount of pesticide applied to the tree and is often referred to on the insecticide label. A pesticide user will want to keep this number handy while measuring the chemical. Another consideration is the cost of treatment. That is often a complicated issue, depending on many factors. There is an online calculator available through Purdue University that may assist landowners in making the decision. You can find it at http://extension.entm.purdue.edu/treecomputer/. Using the calculator will give you a side-by-side comparison of the cost to remove, remove/replace and treat with different pesticides. The calculator is free, but users must register a user name and password. “Generally speaking, the developers of the calculator assert that in most cases, it is more economical to protect ash trees with pesticides than it is to replace them,” Trickel said. For more information related to the research and science behind selecting an appropriate insecticide, the North Central Integrated Pest Management Center developed a publication, Insecticide Options for Protecting Ash Trees from Emerald Ash Borer. It is as extensive guide that answers many common questions. To learn more about insecticides for emerald ash borer, go to www.emeraldashborer.info/files/multistate_eab_insecticide_fact_sheet.pdf for this online publication. For additional resources regarding ash trees in the urban environment, visit the N.C. Forest Service’s Managing Emerald Ash Borer in Urban Areas page at www.ncforestservice.gov/forest_health/forest_health_eab.htm. The Pesticide Guide is posted there, along with other tools to help in the identification and decision making process. The N.C. Forest Service and the NCDA&CS Plant Industry Division continue to monitor the emerald ash borer. If you suspect you have the insect, please contact your county ranger, call the NCDA&CS Plant Industry Division hotline at 1-800-206-9333, or email information to at [email protected].